Hello there! 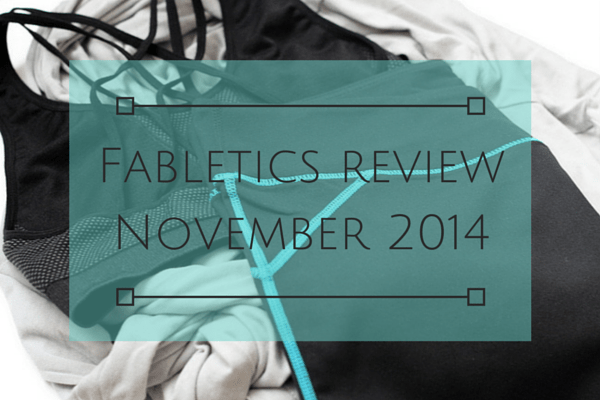 When I come across a brand or product I really like, you can count on me to share it here with you on the blog. Today I’m doing exactly that with my TOMS shoes review. Yes, my husband is also named Tom so I may be a tad biased, but honestly, I bought a pair of TOMS on a whim and they have exceeded my expectations. Considering a pair of TOMS Classics? 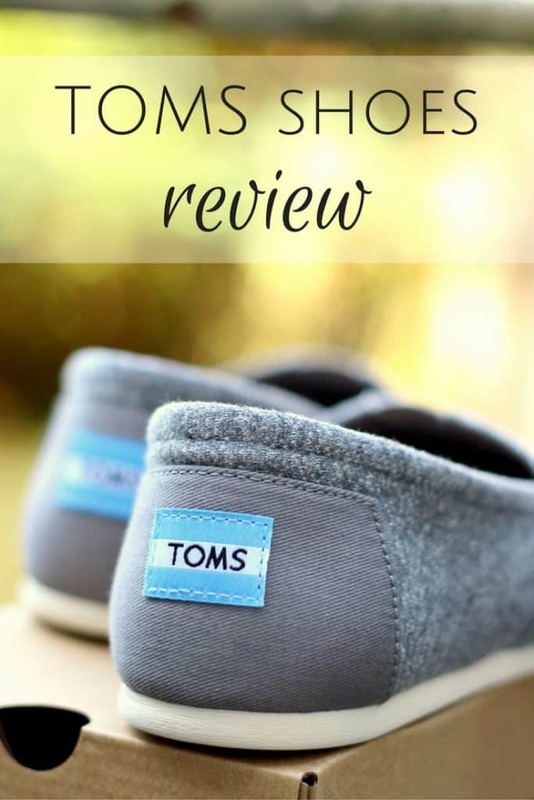 Read on for my TOMS shoes review! I first heard of TOMS a few years ago but wasn’t sold on the style. At that time, I just wasn’t in the market for a casual shoe and they seemed kind of plain for my tastes. I like shoes with a little more going on. Even though I didn’t buy a pair then, I did remember their message. 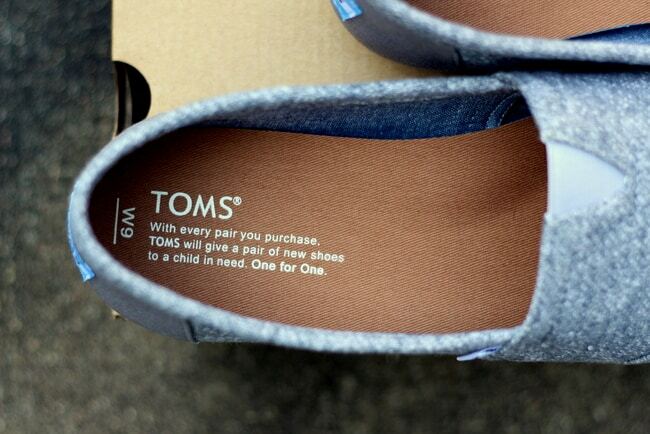 TOMS’ marketing team does a fabulous job at getting their #OneForOne message out there. With every purchase, TOMS helps someone in need — either by donating a pair of shoes, helping with medical care, supporting water system installation and so much more. 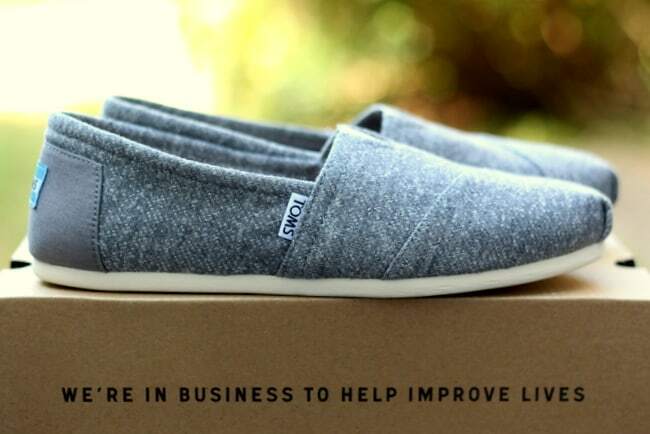 You can feel good about buying TOMS because your money helps improve lives. It’s a nice bonus to know your money is doing a little bit of good in the world. Get $20 off your order via my link. 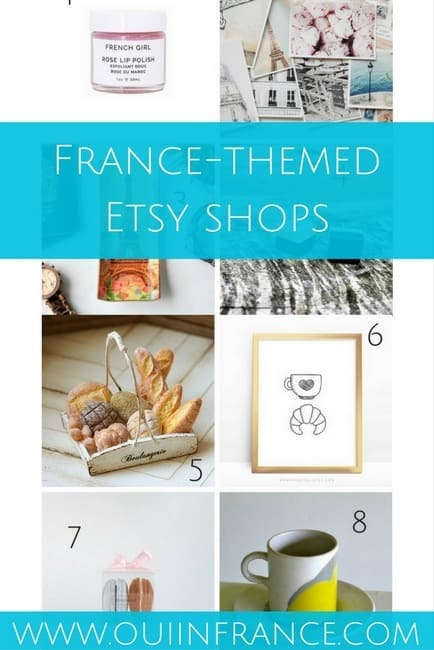 So recently, a friend had shared a picture online of her TOMS, so I headed over to the TOMS France site to see what they were all about. The styles seemed to have more flair than I remembered, and in addition to the classics, TOMS makes boots, sandals, bags, glasses and more. I loved all the patterns and materials from which you could choose. A few minutes later, I impulsively bought the gray shoes pictures in this post, the Grey Marl Women’s Classics. And wow, have they impressed me! Here’s a little info about the Classics style. The top of the shoe has an elastic “V” for and easy on/off fit. 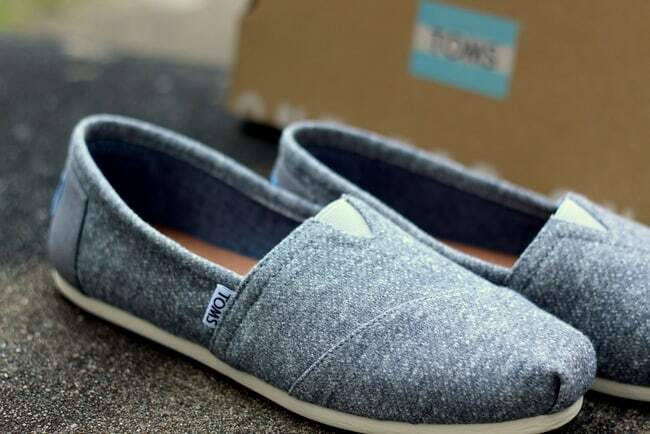 In terms of details, you’ll also see a small TOMS tag (white with black letters) on the side of each shoe and a blue-and-white striped TOMS logo on the heel area. I noticed the molded footbed right away and it was so incredibly comfortable. The shoes also have a rubber outsole so you don’t slip as well as a removable, antimicrobial sock liner. Sizing: True to size. I’m pretty much always a 9 and bought a 9 in TOMS. 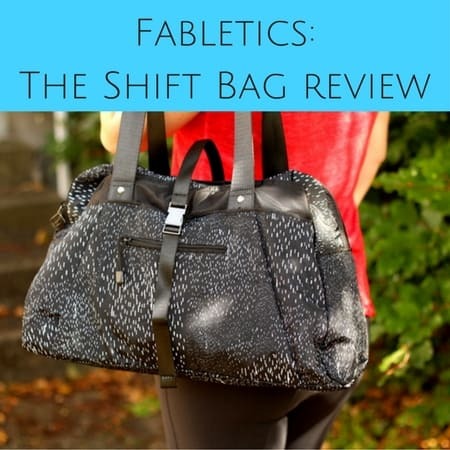 This style’s fit was perfectly snug so they won’t slip off if you have to walk fast. The width felt regular to regular/narrow, which is perfect for me. Overall feel: Your feet will feel supported and cushioned. Super comfortable! Looking at the Classics line, you’ll see they’re somewhat plain without too much detailing or hardware, but once you slip your foot into them, you’ll see why they’ve become my new favorite casual shoe. They look great with casual pants, shorts and even skirts and will easily transition into fall. I can’t speak to their durability yet since I’ve only worn them for about a week, but I’ll be sure to update the post and report back on quality once I’ve worn them a bit more. Get your own pair on the TOMS website here ($20 discount via my link!). or $15 off $75 or $20 off $100 with code VENICE at TOMS! UPDATE 3/25/17: After the first couple of wears, my pair of TOMS molded to my feet and I love them. 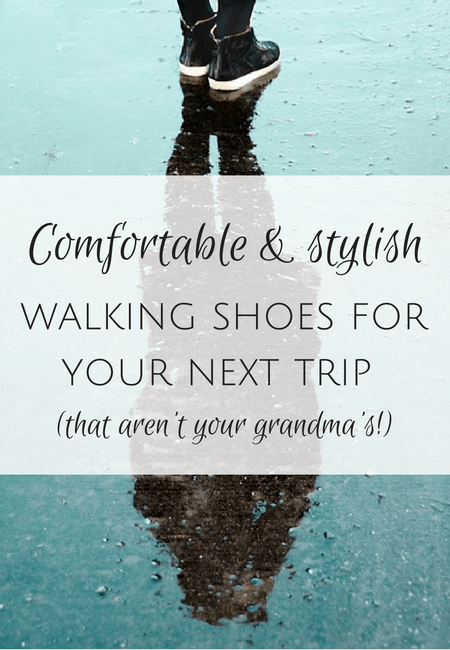 They’re so comfortable and are great for errands or even walking a decent bit. I was out all afternoon and no blisters! 10 out of 10. LOVE them. Have you bought a pair of TOMS shoes before? What do you think? $15 off $75 or $20 off $100 with code VENICE at TOMS! Disclosure: I happily paid for my TOMS with my own money. I love them! I have wanted a pair of Toms for some time actually. I think TOMS shoes are cute. I just bought my second pair. They’re very snug, but I remember my first pair were like that and then they stretched out so they were easier to slip on. Cool, did you get a Classics style or go with a sandal or boot? I have my eye on some booties for fall!